RICHARDSON, Texas – The LeTourneau University softball team has been picked to finish eighth in the American Southwest Conference Preseason Poll following a vote from the ASC coaches and sports information directors. 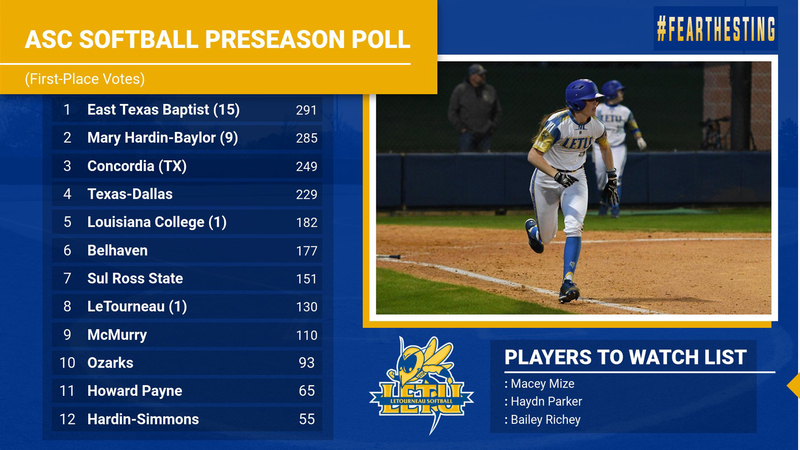 LeTourneau’s Macey Mize, Haydn Parker, and Bailey Richey have been picked to the Preseason Players to Watch list. The YellowJackets, receiving 130 total votes and a single first-place vote, beat out McMurry (110 points), Ozarks (93 points), Howard Payne (65 points) and Hardin Simmons who rounded out the poll with 55 points. East Texas Baptist was tabbed for a first-place finish, earning a total of 291 points and 15 first place votes followed by Mary Hardin-Baylor who has been picked to finish second after receiving 285 points along with nine first-place votes. Concordia Texas rounded out the top three with 249 points. Also picking up a first-place vote and projected fifth-place finish was Louisiana College. Reigning Conference champions and national qualifiers Texas-Tyler is ineligible for this year’s regular-season title and ASC Championships due to NCAA Division II reclassifying. Mize, just one of five returners for the YellowJackets, will enter her senior season at LeTourneau. The Waco, Texas native earned third-team All-ASC honors after hitting .379, recording 25 RBIs and five home runs in 2018 while also throwing out ten runners stealing in her 37 starts behind the plate for the YellowJackets. Parker comes to LeTourneau after spending one season at Campbell University Buies Creek, North Carolina. An all-district selection at New Braunfels High School, Haydn recorded 10 hits and one home run, while posting a .918 fielding percentage in her 2018 campaign with the Camels. Richey will enter her first season as a YellowJacket, coming to LeTourneau from Galena Park, Texas where she was a four-time all-district section after posting a 2.03 ERA her senior season. The YellowJackets will open their 2019 season on Saturday, February 9 with a doubleheader at home vs. Schreiner University. First pitch on the 2019 campaign is set for 12:00 p.m.